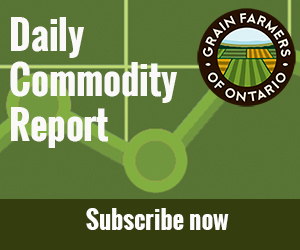 SINCE 2012, WHEN concerns around bee health first arose in the province, Grain Farmers of Ontario has taken an active leadership role to minimize the negative impacts crop farming practices may have on bees. Over the past few years, efforts have expanded in this area to also look at ways grain farmers can support pollinators and improve their health and productivity. Together, with collaboration among stakeholders and experts, a sustainable and workable solution is possible. The Pollinator Task Force (Task Force) was assembled by Grain Farmers of Ontario in the winter of 2014 to help identify opportunities to enhance pollinator and managed bee health. To consider current farm and beekeeping practices in order to uncover and recommend changes that can be implemented to make meaningful contributions to enhance the health of pollinators and honey bees in Ontario. The Task Force reviewed the results of consultations with more than 900 grain farmers across Ontario in early January 2015, collected information from a variety of sources, and met with experts with field experience to formulate recommendations. These recommendations have been compiled into the Ontario Pollinator Health Blueprint. The Ontario Pollinator Health Blueprint was developed by the Task Force to enhance pollinator and managed bee health in Ontario by recommending the implementation of changes that are practical, avoid undo economic compromise for growers and beekeepers, and are verifiable. Following is a Ten Point Action Plan to enhance pollinator health through specific actions by farmers, beekeepers, agricultural retailers, Certified Crop Advisors, the Ontario government, interested stakeholders, and the public. Establish one million acres of self-sustaining pollinator habitat that will provide a sequence of continuous blooms throughout the seasons. This will be achieved by repurposing farm land, private land, and public land for pollinator friendly habitat. Establish a Pollinator Health and Environment Initiative to financially assist in delivering the Pollinator Health Blueprint action plan that will enhance pollinator health and environmental sustainability in Ontario. Ensure all farmers have access to untreated seed, understand the cost differences between treatment options, and consider untreated seed options through discussion with their seed supplier. Encourage the industry to take steps to reduce the volume of neonicotinoids sold in Ontario, through a commitment by industry to reduce high rate applications (that do not exceed the minimum recommended label rate). Improve the overall health of managed honey bees and reduce the exposure of pesticides in-hive through the implementation of a verification system that ensures adherence to standardized Beekeeping Best Management Practices, application technology to reduce exposure, and mandatory registration on DriftWatch. Implement a program to improve communications between beekeepers and farmers through workshops and a young farmer/young beekeeper pairing program for networking and information sharing.